Melon Seed Horchata! Pea Shoot, Mint Tea, and Yuzu! Yuzu, Beetroot and Mango Stone! My message to you is: Have fun! 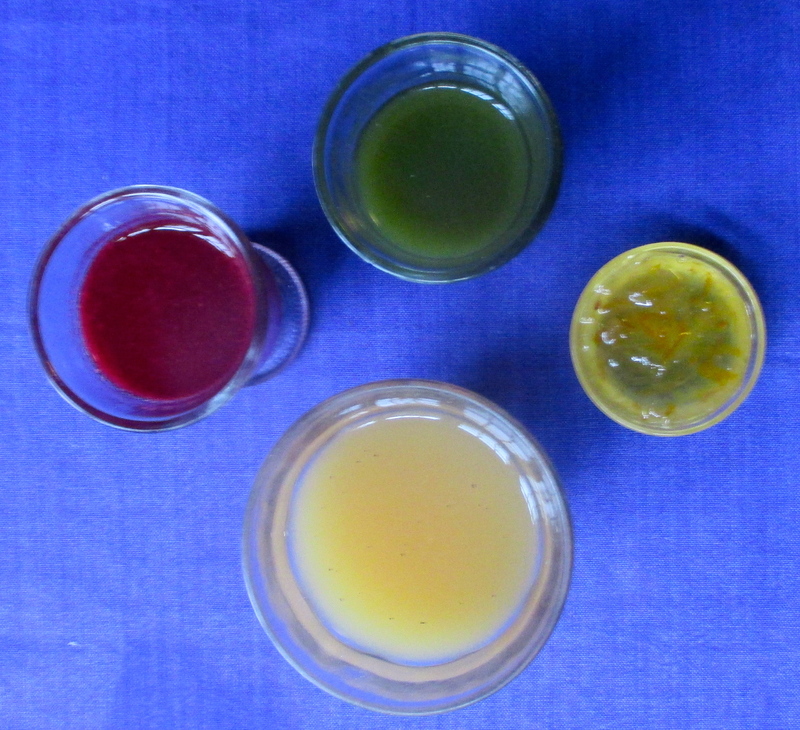 Water Kefir grains are a magical substance (“a culture of bacteria and yeasts held in a polysaccharide biofilm matrix created by the bacteria”) that through fermentation transform liquids into beautiful, healthful “sodas” or carbonated bubblies, non (and sometimes just-barely) alcoholic drinks. There is loads written about Water Kefir on the web, many a how-to guide, including this Nourished Kitchen one that has great information even if a little complicated. And here’s a piece on A Gardener’s Table, a really really beautiful blog. There’s even the tip in the comments to add (sterilised) eggshell (to be removed) to remineralise your grains. 1) Setting your “grains” (the small pearls that are your “culture” or “culturing agent”) in a sweet liquid with maybe some lemon and dried fruit, and they ferment. 2) The Second Ferment in which, you’ve strained out the grains and add the fermented liquid to a flavoured liquid (and this is where your creativity and resourcefulness enters the picture). If you cap/ cover your drink at this stage, you will hopefully get a fizzy, lovely, natural soft drink. Each phase requires 1 -3 days, depending on temperature, sweetness, vitality of your grain, etc. Make sure to check what’s happening pretty often so there is not an explosive, potentially dangerous release of built up gas, especially if you are water-kefiring in glass bottles. Read the Nourished Kitchen link above for a more scientific and detailed explanation, but I hope my simplified version works too. Remember, Kitchencounterculture wants you to feel these techniques are easy and fun, not complicated, challenging, arcane or abstruse. Maybe you know someone who has spare grains (they reproduce!) and if not, they seem to be readily and cheaply available through enterprising sellers on Ebay… and if you are in the USA and on Facebook, this file of the Wild Fermentation group page is all about sharing. A few years ago I was pretty into making drinks with them, experimenting with flavours. This is an old photo. It’s amazing how well visually and in smell and taste the Pea Shoot Juice lasted in the fridge. I’ve become excited to make a fizzy, just true curiosity really. A recipe of sorts: Get sprigs of mint from the garden, made 2 cups of tea, let cool. 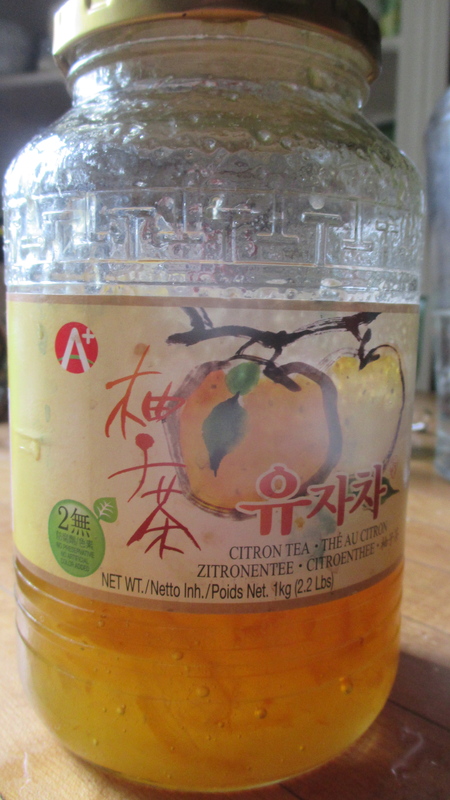 Sweeten with the “CitronTea” –a very sugary Yuzu concentrate– (my Japanese friend Atsuko gave me this for Christmas) (and thinking the other great use would be as a glaze on a fruit tart). Add a palm-of-the-hand of Water Kefir grains. Let get bubbly for a day or two. Mix with the pea shoot juice, cover to cap in the gasses, drink it while it’s alive. And it’s wonderful! Chin chin! 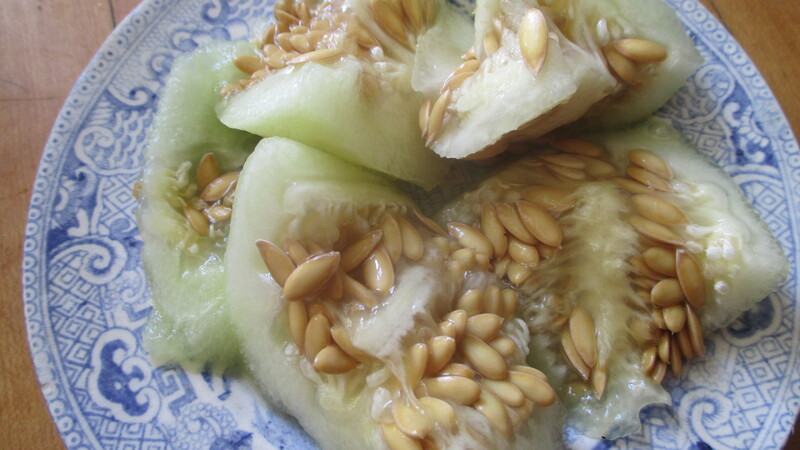 I pureed the melon and squash seeds together, with some water, in the food processor, strained the shell bits out through a colander, and sweetened the drink with Buckwheat Honey. “Not unpalatable, ” said one friend. Which was true– I found the taste interesting, and will next time probably try with only melon seeds for a kind of echo-of-melon flavour. 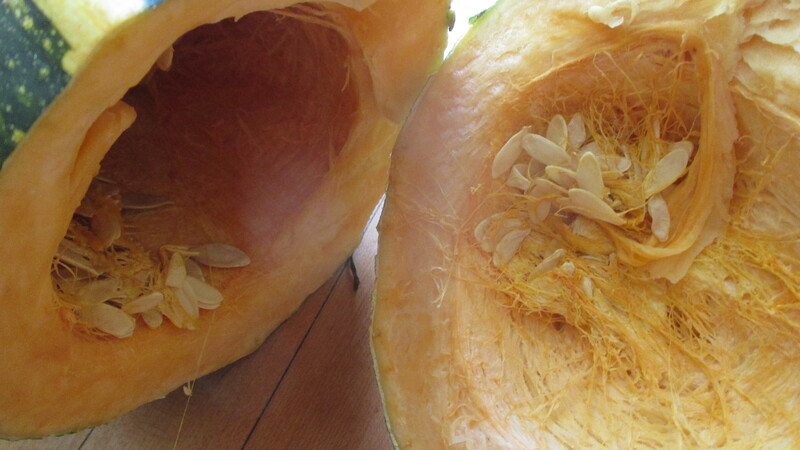 The squash drink– well, I remembered reading that Aztecs grew pumpkins more for seeds than flesh, so somehow using them felt “authentic” (in the way that my Xocolatl was “authentic”). It was a logical next step to ferment the Horchata with the Tipicos grains, which are said to come originally from cactus leaves, an opuntia I think. Hmmm, wish I could get reader opinion. It’s a little weird but so are we! The most delicious success was grating a beetroot into some water, sweetened again with that wonderful Yuzu confection, and a mango pit with some stringy flesh for good measure. I then blended this with some 1st stage Water Kefir, put it all in a jar, and let it sit. Beetroot Bubbly! Was really really really good. My next plan is making Elderflower Champagne, such a traditional and truly beautiful springtime hedgerow drink, but rather than with yeast, as is “traditional,” or wild yeast, as I’ve done in years past (and is emblemised on the KitchenCounterCulture cover photo), with Water Kefir. I really want you, all of you, my finger poking out of your computer screen —YOU! — get yourself some Water Kefir grains and make some lovely fizzy this summer, using all your imagination to put some quench on your thirst and some happy bacteria into your digestive tract. And let me know what flavours you come up with. Annie are water kefir grains different than regular kefir grains? They are completely different cultures. The water kefir (named after I guess but has a thousand names) thrives on sugar and minerals and kefir needs dairy– you can culture coconut milk etc with kefir but it needs replenishment in dairy…. Aneela– YOU must get your Water Kefir shoes on and DANCE! i would be so excited what you would come up with. Very informative! You are right – the process should be fin. Can’t wait for the elderflower champagne – one my favourites. 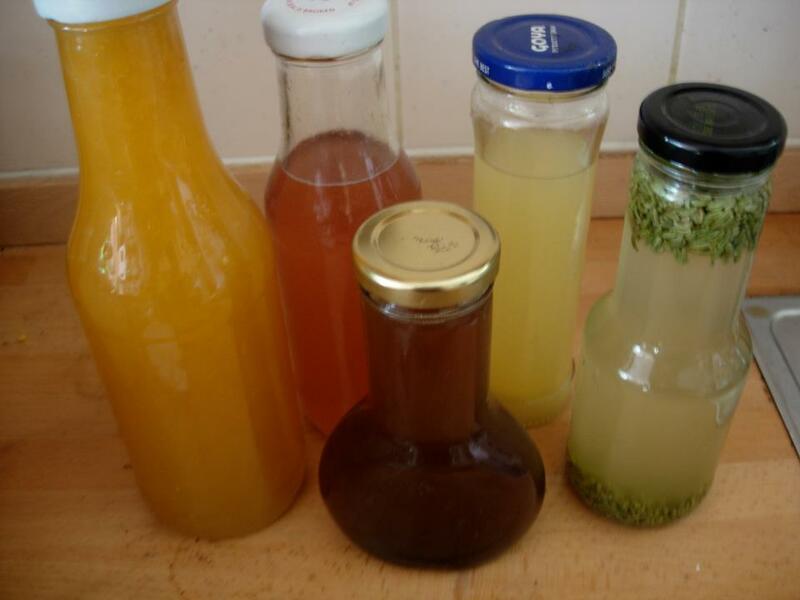 You are so creative with your water kefir! Many thanks for the kind words about my blog. thank you for the compliment, means a lot from you, and thank you for thanking me! oh my! I have been neglecting my water kefir grains, but this just gave the motivation to give them the attention they deserve! Thanks for the inspiration! Hi, a few questions… first is that mentioned here somewhere is that milk and water kefir are completely different but I’ve read elsewhere you can convert milk grains to water. Curious whether the converted grains end up the same as ones that are originally water? My second curiousity is around the coffee: did you introduce it during your first or second fermentation? As brewed or ground coffee? I’m planning to experient with this very soon. This is a really sweet post, I love your creativity and the underlying medicinal opportunities with Kefir and other bacteria colony wonders like Kombucha! I am in Brazil and just got som kefir grains, excited to see how to make an array of healthful goodness providing them with he sugar they need. A great vehicle for extracting herbs in the second ferment. Cheers!! Thanks so much for being in touch. Enjoy yourself fermenting.